2800 meters- Landing here on the small carefully loaded twin otters signifies the beginning of the adventure. As you approach you can see a cliff in front of you, the stall alarm sounds and you quickly come to a stop on the uphill dirt landing strip. 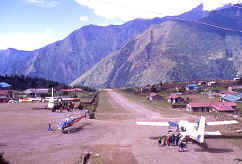 Lukla Airstrip is port of call for Yaks, porters, Mountaineering expeditions and Trekkers. Goods and people are delivered here in the morning hours prior to the afternoon mountain weather setting in. Your trek begins today slowly toward Mt. Everest, following ancient trading routes still used by Rai Magar, Tibetan, Brahmin and Sherpa traders on their way to and from Namche Bazaar. The trail climbs through Mushe and Chaundrikartka at 2680 meters to Chablung, then droops to Ghat at 2550 meters where we will spend the night in a quaint little house right along side the river. From here on the trek is pretty much up, up, up. Namche Bazaar is a village lying at the junction of the Dudh Koshi and a lateral valley that leads to frontier pass of Nangpa La 5500 meters. It is tucked away in a "bowl" at a height of 3440 meters. The first Europeans entered it in 1950 and many more have come since then. However, the basic character of the village remains unchanged. It has an airplane landing strip high above and a temple with a stream of clear water flowing past it. Prayer flags, inscribed with words "Om mani padme hum" flutter from every rooftop and every house has a cottage industry where Yak wool is spun and woven into carpets. Facilities like a bank, a post office, hotels and shops where one can purchase climbing equipment as well as tinned food have sprung up over the years. Namche Bazaar is the major regional training center, and contains the headquarters of the Sagamartha ( Nepally for Everest) National Park. There is plenty to do around Namche Bazaar and a day should be spent here acclimatizing. Hospital where we are given a tour of the facility and a lecture on altitude sickness if the doctors are not too busy. Canadian and New Zealand doctors do two year stints here all on a volunteer basis. Then, on to Khumjung, home to many of our climbing Sherpas. This is also the home of famous gompa where the skull of supposed Yeti (the Abominable Snowman) is preserved under the supervision of the head Lama. To many visitors to the region, the skull seems ore like the outer skin of Himalayan Brown Bear, and this is borne by the report of a scientific exploratory expedition conducted by Sir Edmund Hillary, a copy of which is kept in the gompa. foreign aid and volunteers. From Tengboche, one gets a panoramic view of the Himalayan giants Kwandge, Tawache,Everest, Nuptse, Lhotse, Ama Dablam, Kantenga, and Thamserk. PANGBOCHE: 3860 meters-Pangoche is the highest year-round settlement in the valley where the Imja Khola, coming from the right joins the Dudh Koshi river a little above the village. It has a famous gompa, which thought to be the oldest in the Khumbu region. Buddhism is believed to have been introduced to the Khumbu region toward the end of the century by Lama Sange Dorjee. According to the legend, he flew over the Himalayas and landed on a rock at Pangboche and Tengboche, leaving his footprints embedded on the stone. He is thought to have been responsible for the founding of the first gompas in the Khumbu region. At Pangboche we stay in our good friend Ang Nima Dorjee's home with his wife and children. Many climbing expeditions stay here to retreat from the thin air at base camp prior to their summit pushes and to load up on fresh food and richer air. Nima Dorjee and his wife Lhakpadi are well known to climbers for providing the best French fries in the valley. the world. A 3-day side trip to Everest base camp is possible from here. 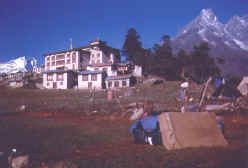 Pheriche and Dingboche are used for acclimatization layovers. 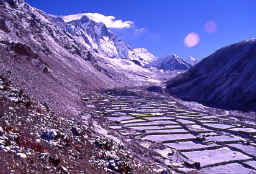 Dingboche is a summer village where the Sherpa people plant potatoes. They also graze their yaks in the valley that leads out of there up to Chukung Ri. We use Chukung Ri as an acclimatization hiking area. You will enjoy magnificent views of the backside of Ama Dablam and the great Lhotse wall from here. 4930 meters - the trail climbs to Phalang Karpa at 4340 meters then Duglha at 4620 meters before reaching Loboche at 4930 meters. Loboche has seen had many improvements in the last couple of years. Mainly since the book “Into Thin Air” wrote it up as being a less than desirable place to rest. Due to the increased numbers visiting this area new lodges are being built and are now very comfortable. CAMP 5300 meters Kala Pattar is a small mountain 5545 m high on the southern flank of Pumori (7145m). 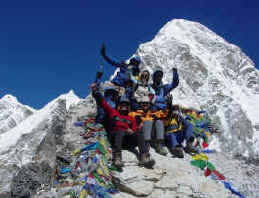 It is a trekking peak and every year tourists climb the peak to enjoy the fantastic panoramic views it offers of the Khumbu glacier, Everest and nearby peaks like Lhotse and Nuptse. The east Makalu, Ama Dablam, Pumori, and Cho Oyu are visible. From here you can look down onto Everest and Pumori Base Camp, as it is higher. The views of Everest are far superior to being at Everest Base Camp itself. Pumori Base Camp has been referred to on our past expeditions as the beach. A natural sandy area is in the perfect spot. Now we descend over the next few days back to Namache Bazaar then to Lukla airstrip. As we fly back to Kathmandu we are joined with new friends while reflecting back on where we have been. A world like no other far away and very different from what we are used to.